Fairuza Balk (born May 21, 1974) is an American film actress. She made her theatrical film debut as Dorothy Gale in Disney's 1985 film Return to Oz. Balk also made appearances in Valmont, The Craft, The Island of Dr. Moreau, American History X, The Waterboy, Almost Famous, and Personal Velocity: Three Portraits. Balk was born as Fairuza Alejandra Feldthouse in Point Reyes, California. Until age two, Balk lived in Cloverdale, California with her mother. They then moved to Vancouver, British Columbia, where she began acting at age six. They moved from London to Paris for another role. They remained there for six months before returning to Vancouver. Balk moved to Los Angeles as a young woman upon signing to act in The Craft. Fairuza's mother, Cathryn Balk, has studied, performed, and taught the ethnic and traditional dance forms of many countries such as Egypt, Turkey, Morocco and Spain. Her father, Solomon Feldthouse, was one of the founding members of the 1960s psychedelic rock group Kaleidoscope, and is also a traveling folk musician. He was born in Pingree, Idaho and between the ages of 6 and 10, he lived in Turkey where he learned Greek, Turkish and Iraqui/Iranian music. Balk has stated that her father is of Romani and Cherokee ancestry, and that her mother is of Irish and French descent. Balk's debut role was in a television film titled The Best Christmas Pageant Ever, produced in 1983. While in London, Balk was cast by Walt Disney Productions to star as Dorothy Gale in Return to Oz, the unofficial sequel to MGM's 1939 musical The Wizard of Oz. This role led to other, minor roles, including that of Mildred Hubble in The Worst Witch, and in 1988, at age 14, she moved to Paris to work on Valmont with Miloš Forman. By 1989 she was back in Vancouver, where she attended high school. However, she soon decided to take correspondence courses instead and went back to Hollywood, where she gained increasing notice as an actress. In 1992 she was awarded an Independent Spirit Award as best actress for her performance in the Allison Anders film Gas Food Lodging. In 1996, she appeared in a lead role in The Craft, in which her character formed a teenage coven with characters portrayed by Neve Campbell, Rachel True and Robin Tunney. Since The Craft, Balk has continued to find roles, primarily dark ones. In 1996 she co-starred in The Island of Dr Moreau with Marlon Brando, Val Kilmer and David Thewlis. In 1998 she gave an intense performance as a neo-Nazi goth-punk opposite Edward Norton in his Academy Award-nominated performance in American History X, and was featured in The Waterboy, alongside Adam Sandler. Since 2000, she has appeared in over a dozen films. She has also done voice work for animated films, TV shows and video games, including Justice League, Family Guy, Grand Theft Auto: Vice City and Lords of Ever Quest. The 2007 documentary Return To Oz: The Joy That Got Away was dedicated to her. In 2010, Balk released the single "Stormwinds" under the artist title "Armed Love Militia". In 2011, Balk began to exhibit art in Los Angeles and New York. On August 4, 2012, she participated in the group show 'MiXTAPE', with other notable artists Mark Ryden, Camille Rose Garcia, Jessicka Addams, and Marion Peck. Artists were asked to pick a song and create art inspired by that song. Fairuza chose the song “Nuages” by Django Reinhardt and created a 16"x20"x12" mixed-media sculpture. The eclectic mix of songs chosen were featured for digital download on iTunes. 2000 Family Guy Connie D'Amico (voice) Episode: "Let's Go to the Hop"
2003 Justice League Penny Dee (voice) Episode: "Only a Dream"
Masters of Horror Stacia Episode: "Pick Me Up"
↑ California Birth Index 1905–1995. ↑ "Fairuza Balk Biography (1974-)". FilmReference.com. 2010. Retrieved 2010-08-12. 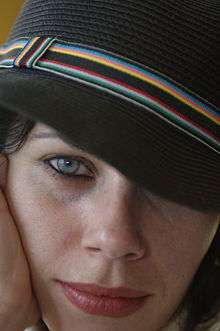 ↑ "Fairuza Balk Photos, Gossip, Bio & Reviews". AskMen.com. IGN Entertainment, Inc. 2010. Retrieved 2010-08-12. ↑ "The Rise and Fall of the Neoprene Lizards — the Kaleidoscope Story, p. 1". PulsatingDream.com. 2006. Retrieved 2010-08-12. ↑ Balk, Fairuza (2010-09-10). "Persecution of the Roma". Fairuza.com. Retrieved 2010-09-20. ↑ "Fairuza Balk on Twitter". Twitter. ↑ "The Wizard of Oz Production Timeline". The Walt Disney releases an unofficial sequel to the 1939 film titled Return to Oz and starring Fairuza Balk. The film is not a musical, and is much darker in tone than the 1939 film. Wikimedia Commons has media related to Fairuza Balk.